By now, most people have the answer to “Who did Negan kill?” from The Walking Dead episode on Sunday. Truth be told, I am a season behind but thanks to the rapid fire of social media, I have an idea of what is going on. Thanks to that same social media fireball, I even found out who died. Turns out it was one of my favorite characters. A character that I adored ever since I started reading the graphic novels (but then stopped at a certain point) and seen onscreen. The level of brutality has always been presented across print and video but the unrelenting nature of it shows no signs of stopping. For someone who is extremely squeamish of gore and horror, it is surprising that I have been able to stick it out for so long. The Walking Dead has shockingly survived seven years. Seven years of the death, plot holes, cliff hangers, and Carl going missing. As the episodes trudge on, it becomes less of a zombie focus and more of the human condition. That’s pretty much what zombie apocalypses are for. Zombies can represent any metaphor of what human kind repels but is unable to escape. This can breed an endless possibility of situations that can test the strength of our heroes. When does it end? Through death? Through sheer willpower? Darkest and deepest human need to survive? Zombies are more than just a scare tactic. They’re a rotting corpse of a platform for thoughts. 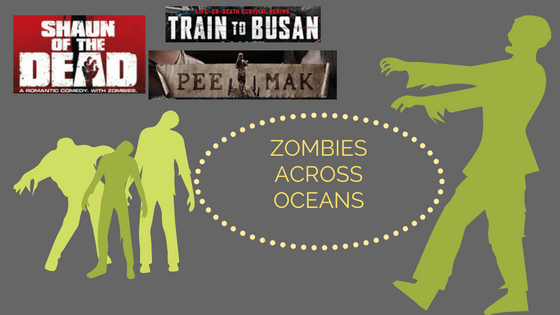 So in the spirit of Halloween, I would like to offer zombie movies from across the ocean.The Walking Dead may be a cultural phenomenon of apocalyptic proportions but sometimes it’s refreshing to get another perspective of zombies. This movie has to be a staple for anyone who enjoys horror movies and for those who scared horror movies. Before Simon Pegg became a permanent fixture in pop culture land, he began the Corenetto trilogy with Shaun of the Dead. The world can end but Shaun (played by Simon Pegg) would never know it. His life is just working his dead end job, trying to maintain a relationship with his girlfriend, and drink at the Winchester Pub with his best friend, Ed (played by Nick Frost). As it so happens, the zombie apocalypse does descend around Shaun and now it’s up to him to somehow, someway save his friends, family, and survive. The blockbuster of South Korean this year was Train to Busan. This horror/suspense movie made an impact both overseas and over here in Los Angeles. Nestled with the city is the CGV theater, a theater that features not only domestic but Korean movies with English subtitles. Every showing of Train to Busan at CGV was sold out. Seok Woo (played by Yoo Gong) is brilliant with business and strategy but falters when it comes to caring for his daughter, Soo-an (played by Soo-an Kim). Soo-an convinces her very reluctant father to take her to Busan to visit her mother (the parents are divorced). So they board a train and head off to Busan. At first everyone on the train is oblivious to the dangers beyond the tracks. Their safety is short lived as the trouble begins when one of the infected is able to hop on the plane. This movie is more of a ghost story than it is a zombie one. Since there is a reincarnation angle to it, this will be added to the zombie list. Pee Mak is an familiar tale among Thais as this has been retold in several versions. During the beginning of the Rattanakosin Dynasty (1782- Present) in Thailand, a young man named Mak (played by Mario Maurer) goes off to fight the war. He leaves behind his loving wife, Nak(played by Davika Hoorne). When Mak and his friends come back from the war, the village is completely changed. Only Nak’s love for Mak seems be steady. Although Mak is oblivious, his friends are not. For there is something not right with Nak. This movie became the blockbuster hit for 2013. The classic ghost story was given a new comedy/horror make over that just gave the whole story a whole new depth. The special effects and atmosphere made it all work. It is more comedy than it is horror but it is still so enjoyable. (available on iTunes).